The current Benromach Distillery is owned by the independent bottler Gordon & MacPhail. While the name and site dates back to 1898, G&M installed all new equipment after they bought the distillery in 1992. The old equipment had previously been sold off or junked. Instead of replicating the old stills, G&M designed and built smaller stills. They began releasing whisky from the old stocks and then when their new whisky was ready they began selling from the new stocks. These two spirits, however, are effectively from different distilleries despite having the same name. For their own distilled whiskies, G&M wanted to recreate an older style of Speyside whisky. While Speyside whiskies are now famous for being smooth and sweet without peat, they used to contain moderate levels peat, when peat was a major fuel source in the area. The Benromach 10 year old represents the whisky profile they were trying to create, while the Benromach Peat Smoke is more of an experimental bottling to see what a heavily peated speyside would be like. 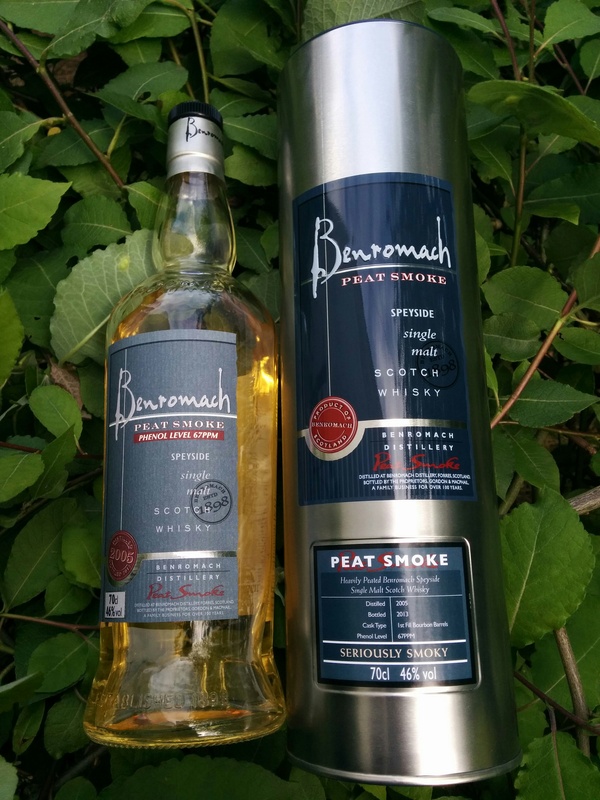 The Benromach Peat Smoke is released in batches however the batch numbers are not printed on the bottles. Instead batches are defined by the “specs” printed on the tin which define the distill year, bottling year, peat level, and cask type. AliceinWhiskyland reviewed this expression a while back on Reddit. That review was copied to this post hence some of the anachronisms. The phenols greet you at the door but quickly move aside leaving you with the taste of burnt honey and roasted almonds. A brief moment of lingering sweetness before it’s gone. I would highly recommend this expression to anyone hesitant about peated whisky. Its phenol level is not a joke, but combined with Benromach’s speyside charm, it would make the perfect gateway dram into the peat monsters. Burning smoke. Deep sweetness like fruit syrup freshly varnished wood. The peat is quite evident as it dominates in the foreground like a bon fire. Behind the smoke there is a nice rich custard sweetness but it is slightly overshadowed by the peat. The peat is more smokey than peaty per se. It’s got the smoke but not so much the herbal tones. Like a log fire. Charcoal and ash. A BBQ grill after the party. A bit of bitterness. This is a decent dram but the peat and sweetness seem a bit lacking in dimension. The peat overshadows the other flavours and the peat itself is quite dry. It’s not as balanced as the Benromach 10 and not as punchy as the big peat monsters of Islay. An interesting dram at a decent price but not necessarily at the top of my shopping list.